The punitive tax regime that encouraged smuggling at every level of society needs to be seen in context to the size of the debt that Britain was facing. After successive wars with Spain, America and France the National Debt had grown more than five-fold within 80 years. In November 1784 the Reading Mercury published a summary of how the debt had built up between 1701 and 1784. 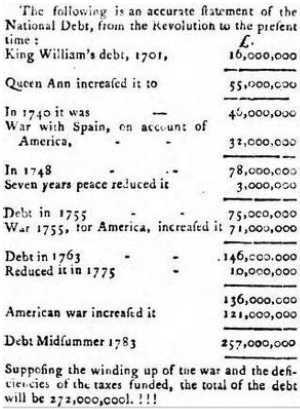 The cost of the war with Spain and America had seen the debt rise from £46m in 1740 to £257m by midsummer 1783. The Reading Mercury estimated that if the war with America was concluded the tally would stand at £272m. A succession of prime ministers recognised the growing scale of the problem but it would be Pitt the Younger who worked so arduously at reducing what he saw as a central threat to the nation whilst juggling yet another war, this time with the French. By August 1795 the National Debt reached £409,655,570. The annual interest alone was over £16 million and the cost of the war for the last year added £62,357,312. The Government was so worried and Pitt’s critics so vocal he was persuaded to appoint a Finance Committee similar to the one that had checked overspending during the American war. This Committee would, over the years, document vast sums of money seeping out because of ‘fraud, lack of competitive tendering, a mass of sinecures and fees and an ancient unchecked accounting system hopelessly in arrears’. Under these circumstances, it is hard to believe that Britain was richer than France and better organised, financially, but that appears to be the case. Attentive housekeeping enforced under Parliamentary power could monitor the accounts of the Treasury, challenge and ask questions. In an attempt to manage the Debt, Pitt had introduced his ridiculed ‘sinking fund’, setting aside £1 million to invest each year and intended to pay off the Debt. The fund might have worked in peace time but with another costly war came massive costs and more debt. To find money for the army, navy, armaments and home defence, and for subsidies to foreign allies (Prussia and Austria in particular) Pitt increased taxes and raised loans. The loans were primarily financed through consols ‘consolidated annuities’ paying 3 per cent to investors. This might have been seen as tax burden on the more wealthy, but there was a real fear that this would reach down to the poor as servants, grooms, carriage makers and farmers lost their jobs and went bankrupt. It had not taken long for any supporters of the Revolution to realise that this was a threat to the fabric of British society. The poor had overturned the bastions of power and seized it for themselves. Attempt were made to formulate peace proposals but met with little success. When news of Louis’ execution reached London, Pitt expelled the French Ambassador. On February 1st the Convention declared war on Great Britain and the Republic of the United Netherlands. War had not only been declared, it was at the very doorstep of the country, Pitt would tell the House of Commons eleven days’ later. Here was a war that needed checking because the principle of what was happening across the Channel ‘threatened the most fatal consequences to the tranquility of this country, the security of its allies, the good order of every European government and the happiness of the whole human race’ as Pitt told the House. What Britain faced was an enemy with a population twice its size and a new concept in European military development – the first system of conscription where each citizen had to show their loyalty to the Republic. In theory, also, the financial strengths of France should have outweighed those of Britain, but it was arguably financial acumen that would put this victory decisively in the English camp, even though the cost was enormous. 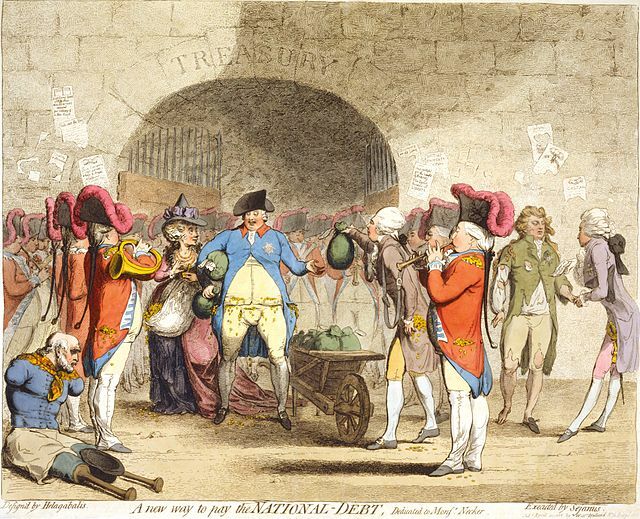 ‘A new way to pay the National-Debt’ by James Gillray, published April 1786. The National Debt covered amongst other things, the overheads of the royal household and the cost of wars. These two costs alone had a very mixed reception amongst the public. 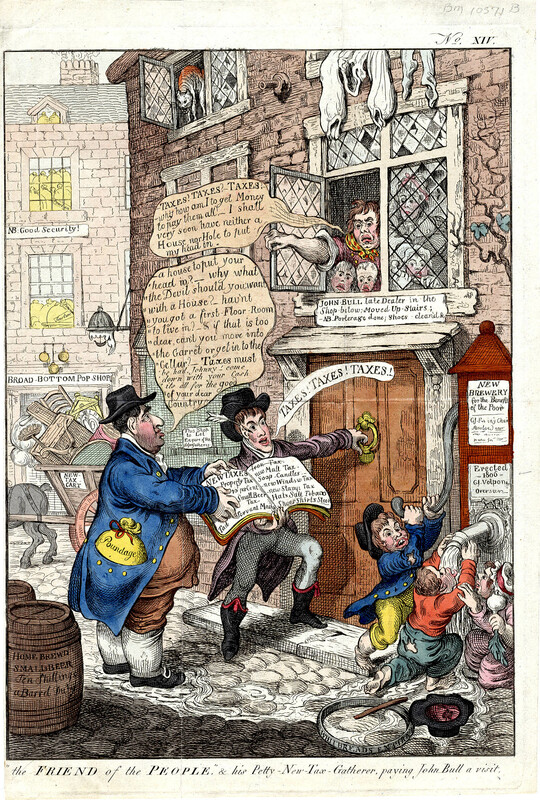 Satirists like Gillray used it to good effect in their cartoons. Practically anything and everything now attracted a tax. Imports of course, remained a prime target for increased taxation if only because this was an established practice. However, the double-taxation system (customs duty and excise duty) was seen as particularly cynical and at times, Draconian. If this was the general sentiment then any announcement of new taxes on imported items was like a shopping list for smugglers. Everyone recognised this and everyone realised what the solution was: End the tax and you end the reason for smuggling but that didn’t solve the estimated £679 million debt mountain that had accrued by the early part of the 1800s. This mountain was more than double the GDP. And the cost of the wars with the French, alone, would top £831 million. ‘Excise’ was a type of tax on domestic consumption. During the years of the Civil War, it covered many different items. But it was reduced ten years later to cover just chocolate, coffee, tea, beer and spirits. However, it was an effective way of raising tax revenue, so successive governments re-introduced and repealed Excise duty on various items including essentials such as salt, leather and soap. The difference between these two taxes was of little interest to the people, who cared only that what they bought was becoming increasingly expensive. 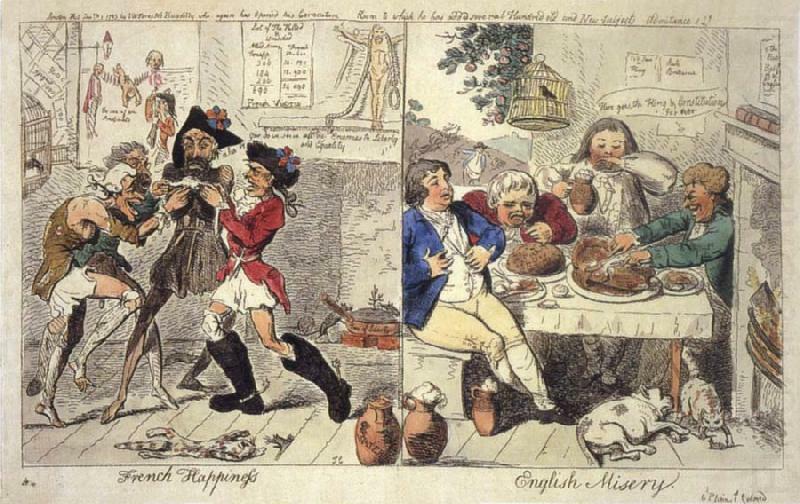 In the 18th century, extraordinary quantities of goods were smuggled into Britain. At one time it was estimated that at least two thirds of all tobacco consumed in London was contraband. In some areas, whole communities became dependent on smuggling. Many communities in the late 1700s (such as the Scilly Isles) were in league with the smugglers who could provide contraband goods, such as tea or tobacco, which they could not otherwise afford. The heyday of smuggling was during the wars against France and Napoleon. After the conclusion of the Napoleonic Wars in 1815 smuggling went into decline. This was accelerated when the preventive effort was stepped up with the introduction of coastal blockades, blockademen and the Coastguard. By the late 1820s, the effectiveness of the two forces was apparent. With the end of the war, the authorities finally had the manpower to patrol and regulate the coast – especially around the Kent and Sussex coastline. Jenny Uglow. In These Times: Living in Britain through Napoleon’s Ward, 1793-1815. Fascinating post and thanks for sharing your research. I’m currently working on the the various social and economic problems caused by an earlier war against France: that of the 1690s. As you’d expect, I’m finding many of the same issues and complaints then, though I’m sadly lacking in such wonderful visual illustrations. I wish Gillray had been publishing in my period! Have you taken a look at Uglow’s new book ‘In These Times’? It seems like it might have some useful material on this. Thank you for your kind comments, Brodie. As you rightly point out, I’m lucky to have the eyes of the Georgian cartoonists to see with as well as all the other sources – although you have to recognize their political nuances to get the full meaning. I’ve found so many surprises in the detail of the cartoon – they include all sorts of asides and quips as well as focusing on the key theme. The Jenny Uglow book is full of riches. Just looking at her sources shows how much work must have gone into “In These Times”. I’ve cited her at the end of this blog which is the least one can do and really recommend her work. For me, the portraits are invaluable. Again, thank you for taking time to comment. Ah yes, I missed the citation of Uglow somehow. Glad to hear you’ve found it useful: I’m planning to use it as a comparator when talking about the 1690s.